MSNBC has had a hard time lately. The network fired Martin Bashir and Alec Baldwin for craziness, on-air and off-air respectively. Melissa Harris-Perry was forced to apologize, first on Twitter and then, tearfully, on the air, for making political hay out of Mitt Romney’s adopted grandson. The network put Ed Schulz out to pasture, and most people wrote Chris Matthews off as a hysteric long ago, so that pretty much leaves Rachel Maddow–amazingly enough–as MSNBC’s supposed voice of sanity. Eliana Johnson has reported on Maddow’s status as the “queen” of MSNBC, who wields more control than anyone else over the network’s often-crazed content. But is Maddow any better than the rest? A recent incident suggests that if anything, she is worse. But this is an utter non sequitur. The State Policy Network–let alone the Koch brothers!–had nothing to do with the Florida legislation. Ms. Maddow perhaps was trying to suggest that the State Policy Network is a funding source for FFGA, so that the Koch brothers have indirectly supported FFGA, albeit to a ridiculously small level (nowhere near $1,000 on a pro rata basis). But that isn’t true either. I happen to know a little bit about this, since I was formerly the Chairman of the Board of a think tank that is a member of the State Policy Network. The SPN is like a trade association of conservative think tanks, with members in every state. The SPN doesn’t support the local groups, like FFGA; on the contrary, the local think tanks pay dues to support SPN. So there is no connection–not even a minute, indirect one–between Koch and FFGA. I repeat: as far as we know, no one at Koch had ever heard of FFGA before Rachel Maddow’s show on Thursday of last week, and Koch did nothing–zero, nada–to support the Florida legislation in question. So Rachel Maddow’s entire segment was one big lie. Her central premise, that the Florida welfare statute was an initiative of the Koch brothers, was false, and she knew it. She made the whole thing up to fool the low-IQ viewers who form MSNBC’s base. But the story gets even worse. In an email dated January 3–follow the link above–Koch asked MSNBC to retract, and apologize for, Maddow’s fabrications. Instead of correcting her misrepresentations, Maddow, in her show on Friday, triumphantly refused, saying “I don’t play requests.” Or, in other words, “I lie with impunity, and MSNBC gives me cover.” The left-wing echo chamber swooned. Daily Kos–remember them?–headlined, “Rachel Maddow Speaks Truth to Powerful Koch Brothers.” Raw Story’s sycophantic take was, “Maddow scorches Koch brothers on ‘correction’ demand: ‘I don’t play requests. '” So if you are a left-winger, blatant lies about conservatives make you a hero. But the corruption goes deeper still. 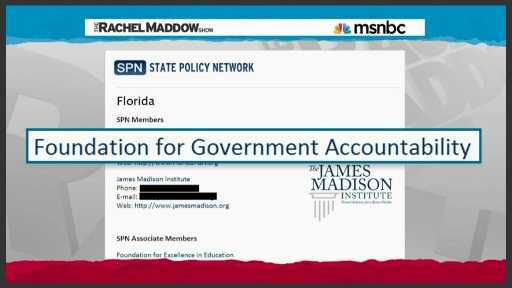 Rachel Maddow says that any company that supports the State Policy Network is “affiliated with” the Florida Foundation for Government Accountability, and is responsible for everything FFGA does. That is wrong, but let’s go with it. Who else, besides Koch, has supported the State Policy Network? You might be surprised: the list includes Microsoft, Facebook, AT&T, Time Warner Cable, GlaxoSmithKline, Kraft Foods, and many more. So Maddow randomly singled out Koch as opposed to any of these other companies as the sponsor of the Florida legislation which, as far as we know, Koch wasn’t even aware of. Well, not randomly, because MSNBC is obsessed with Koch, but you get the point. But wait! A final level of deception remains to be revealed: one of the many companies that have contributed to the State Policy Network is Comcast, which owns MSNBC and is Rachel Maddow’s employer. 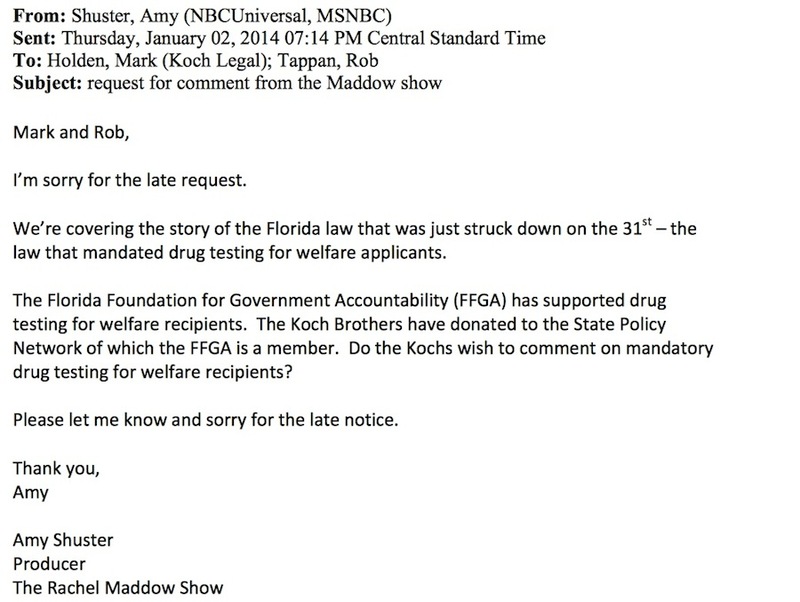 So in her Thursday broadcast, Maddow could equally well have said that MSNBC “ha[s] been promoting forced drug tests for people on welfare,” and that FFGA is an “MSNBC-affiliated group.” She didn’t do this for obvious reasons. She knew that she was addressing a stupid audience that would never know the difference. If Rachel Maddow is the best that MSNBC has to offer, MSNBC is in even deeper trouble than its steep ratings decline would indicate. PAUL ADDS: Wow! This is surely one of the greatest takedowns ever. I hear they are planning to put up an apartment building on the site where Maddow used to be standing.